A refreshing color palette that feels like an escape to paradise. Note: A minimum quantity of 72 must be ordered, and in units of 8 thereafter. 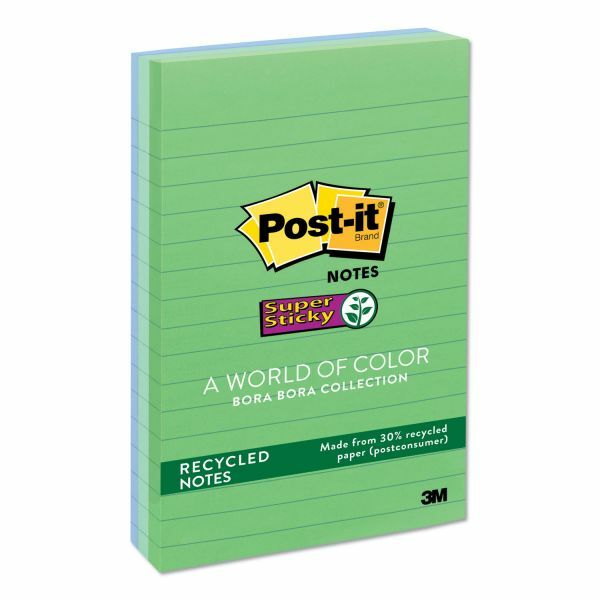 Post-it Notes Super Sticky Recycled Notes in Bora Bora Colors, Lined, 4 x 6, 90-Sheet, 3/Pack - Super sticky notes in tropic breeze colors hold stronger and longer than most self-adhesive notes, so you can be sure that your message gets through. Have the confidence to leave important messages on multiple surfaces including computer monitors, office doors and walls. 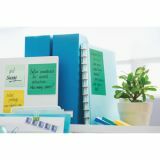 Notes are lined for neater notes and reminders. 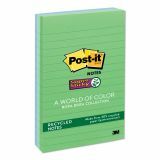 Paper used contains post-consumer recycled material and comes from well-managed forests where trees are replanted. Each pad includes 90 sheets. 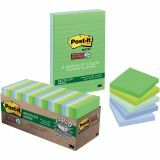 Made with plant-based adhesive.